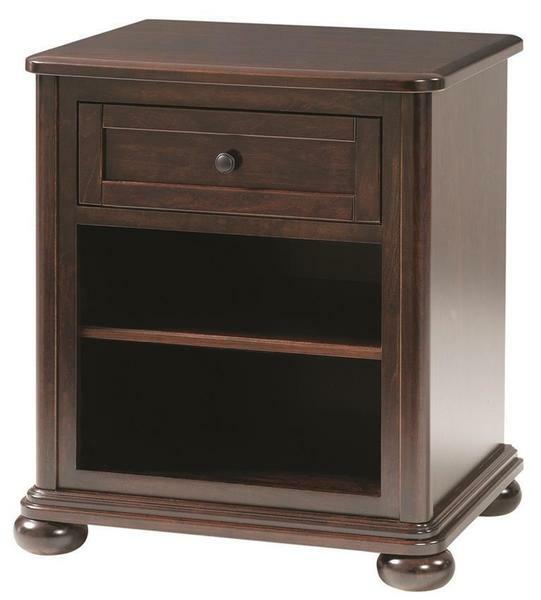 The Amish Hyde Park One Drawer Nightstand is the ultimate bedside piece that is the perfect fit in any bedroom. With a two foot wide top, the one drawer nightstand provides plenty of space for an alarm clock, reading glasses, or any other items needed within an arm's reach from the bed. Below, there is a single drawer that is dovetailed, which provides support for heavier items, along with full extension ball bearing side mount drawer slides that allow for complete access, even to the very back of the drawer. The Hyde Park One Drawer Nightstand also features two open storage compartments with a shelf, which is the ideal location for your favorite books and magazines. Prevent needless drawer slamming by choosing to add on soft close undermount drawer slides to the nightstand. Although majestic in rustic cherry, the Hyde Park One Drawer Nightstand can be easily customized to fit your room's style as we offer a variety of wood, stain, and hardware types to choose from. The Hyde Park One Drawer Nightstand, like many of our products, is constructed by Amish woodworkers who have learned the art from previous generations. The expert craftsmanship of the Amish is apparent in this piece by its smooth edges, and clean, straight lines. Each nightstand is built using a solid hardwood, which means it is built to withstand a lifetime of use. In order to give it a complete and finished look all the way around, an inset back with screw fasteners are included with the purchase. The Hyde Park One Drawer Nightstand is then completed by the Amish builders using a catalyzed finish to bring out the natural wood grains on the nightstand. If you have any questions about the Amish Hyde Park One Drawer Nightstand, or any of our other products, call and speak with one of our Amish Furniture Specialists at: 1 (866) 272-6773.